Schematic of the coating layers in a typical automobile composite body. Mar and scratch damages from a variety of object impacts are shown. Know that sickening feeling when you exit the grocery store and find your car has been banged up by a runaway shopping cart? It may one day be just a bad memory if auto body manufacturers make use of a new suite of tests developed by the National Institute of Standards and Technology (NIST) and three industry partners. Data from these tests could eventually help your vehicle’s exterior better defend itself against dings, dents, scratches and things that go bump on the highway. In a new paper in the journal Progress in Organic Coatings, researchers at four organizations—NIST and industry partners Eastman Chemical Co., the Hyundai America Technical Center and Anton Paar USA—describe three versions of a fast, reliable laboratory method for simulating scratching processes on automobile clearcoats (the uppermost, or surface, layer of an exterior polymer composite coating). The tests are designed to give manufacturers a better understanding of the mechanisms behind those processes so that future coating materials can be made more scratch resistant and resilient. Currently, automobile coating manufacturers use two simple test methods to evaluate clearcoat scratch resistance and predict field performance: the crockmeter and the Amtech-Kistler car wash. The former is a device that uses a robotic ‘finger” moving back and forth with varying degrees of force to mimic damage from human contact and abrasive surfaces. The latter is a rotating wheel of brushes that simulate the impact of car washes on clearcoats. 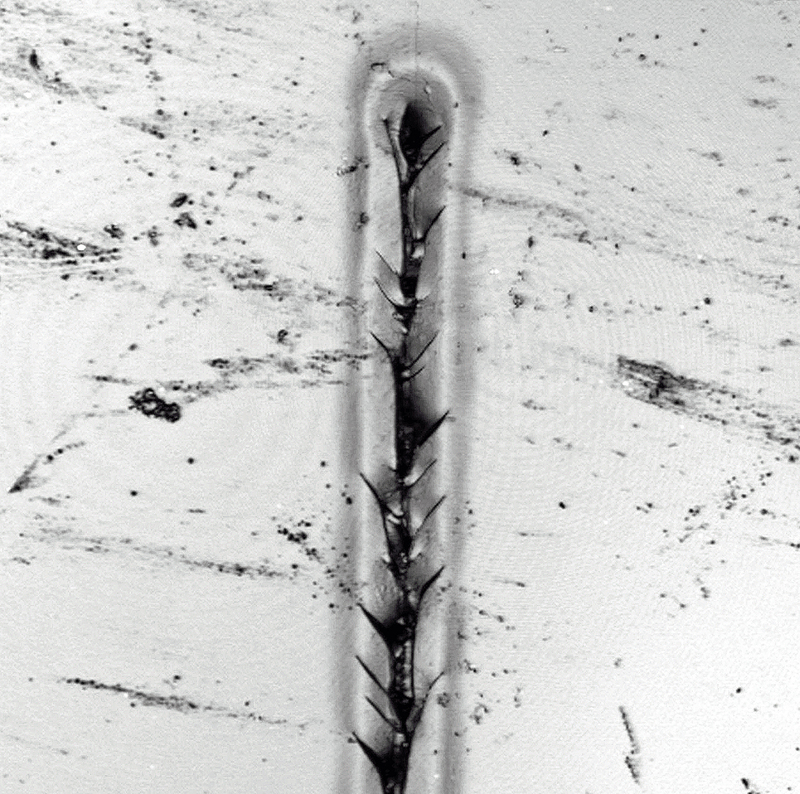 Photomicrograph showing the result of a NIST nanoscale scratch test on a sample of automobile clearcoat material. The scratch, which shows fractures radiating from the line of impact, is 20 micrometers wide, 150 micrometers long and 2 micrometers deep (A micrometer is a millionth of a meter or about half the length of an average E. coli bacterium.). For their test method, the researchers first tapped a diamond-tipped stylus across the surface of a polymer composite sample to map its morphology, then used the stylus to create a scratch and finally, retapped and remapped the surface. Three different scales of scratch tests—nano, micro and macro—were conducted using different size tips and different ranges of force. When scratches in the clearcoat are a few micrometers in depth and width, and occur without fracture, they are referred to as mars. These shallow, difficult-to-see deformations, Sung said, are most often the result of car washing. She explained that the nano-scratch test performed at NIST provided the best data on the mechanisms of marring and light scratches while the micro- and macro-scratch tests conducted by NIST’s partners were better at yielding detailed information about the larger, deeper and more visible deformations known as fracture scratches—the injuries caused by keys, tree branches, shopping carts and other solid objects. “That way, one gets the complete picture of an auto body coating, both qualitatively and quantitatively characterized, so that the tougher coatings created in the lab will work just as well on the road,” Sung said.